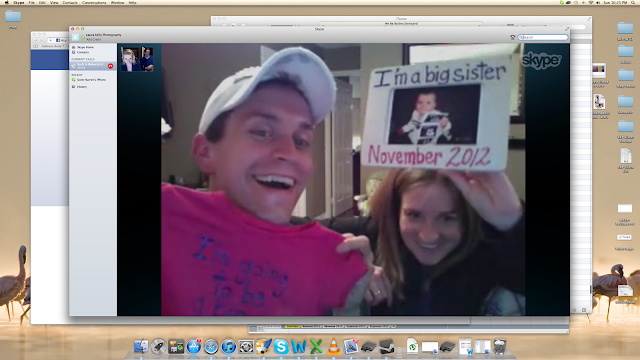 He texted me to Skype him, and with some sense of insistence, he asked for Ryan to be on the video call. But knowing what we know now, it makes sense that both my brother, Scott, and my sister-in-law, Rebecca, were smiling ear to ear while they asked us about our day, our weekend, the visit we had just made from our parents' house...because they had some news. AHHHHH!!!! Ivy is going to be a big sister!!! November 2012, smack dab in the middle of our week in Punta Cana for the wedding. THERE'S A NEW BABY COMING!!!! For those of you with siblings, who spent your childhood years arguing, wrestling, fighting over who gets to sleep in the top bunk...you're not going to understand the bitter part of this equation. My brother is nine years older than me, which makes him more like a father figure than a brother, in my opinion. And my sister-in-law has been on the scene since I was five years old, which makes her much more of a sister than any other title you can inherit by marriage. They've driven hours and hours and hours to be there for every major (and even minor...) event in my life, so it's hard to imagine standing up at the altar and not seeing them there (or my little Ivy-Ivertons!!!). But then I think...what on Earth could be a better wedding gift than a new baby niece or nephew to love ♥ But this does beg the question: what will we ever do if he or she is as to die for as Ivy...?! The truth of the matter is, I couldn't be happier or more excited for them, and with the magic of technology these days, who knows, they may even get Skype'd in for a live viewing of the ceremony lol.